Interestingly, the elevator contractor had disabled the mechanical locking of the first floor interlock when disabling the elevator. With no lock preventing me from opening the hoistway door, I was able to fully open the doors and take this photo which highlights the inside car door system on this Otis passenger elevator of 1993 vintage. First, notice the center parting doors which opened to either side, but also notice that the clutch mechanism is only located on the left side of the frame (the right inside door from the operator's perspective). Notice that where the two doors meet, just to either side of the metal door trim, are the scanner edges, also called electric eyes, which re-open the doors when an object interrupts the light beams. Now, onto the clutch mechanism. 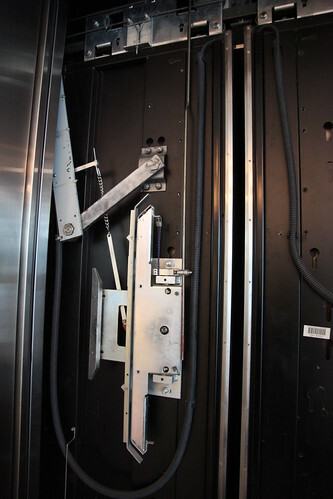 When the elevator arrives, the door motor, on top of the cab, drives the inside doors open, and the clutch mechanism catches the release assembly on the hoistway doors, bringing the hoistway doors along for the ride - opening both sets of doors smoothly and at the same time. One interesting feature to note on this elevator is the mechanical door restrictor. This device, connected to the clutch rod (running vertically), prevents the car doors from being opened from inside the cab (to prevent passengers from trying to escape a stuck car, for example).